Anker made a splash on Kickstarter last year by raising nearly $3,000,000 for their entry into the truly wireless headphone market. If you were too skittish to preorder that far in advance, the final products are here, and available to everyone. 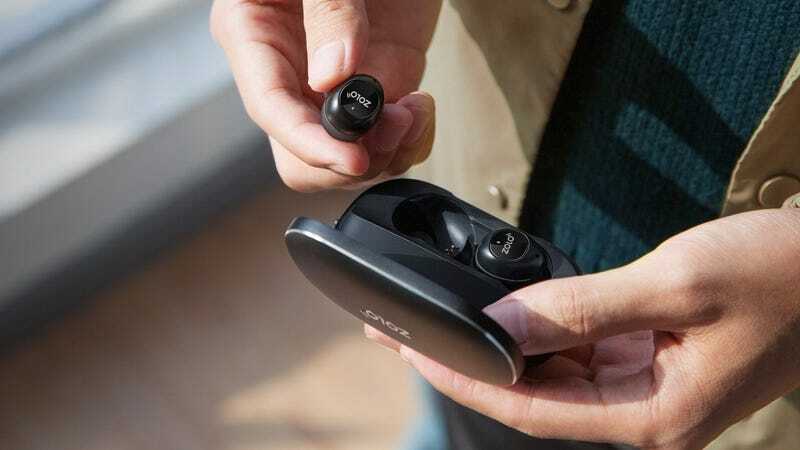 Anker bifurcated its Zolo Liberty headphones into two tiers; the Liberty+ (which was featured on Kickstarter), and the more affordable Liberty model. You can see a comparison of the features here, and we’ll get into some of the differences below, but broadly speaking, they’re similar products. Unlike the AirPods I’ve been using for over a year, Zolo’s headphones are noise isolating, meaning they completely seal off your ear canals, at least once you choose the tips that best fit your ears. On an airplane, that’s a great thing. But on a busy street where you want to be aware of your surroundings, it can be problematic. Luckily, the Liberty+ includes a feature called Transparency, which uses microphones built into the earbuds to take in ambient noise, and mix it with whatever you’re listening to at the time. When using the feature on its own, without any music playing, I found that it actually made nearby noises louder than if I was hearing them with my naked ears. It’s a bit of a bizarre sensation, but it could definitely prove useful when you want to listen to music or podcasts without completely shutting out the world. So how do they sound? They sound fine, basically. I found vocals to be a little crisper than on my AirPods, but they’re otherwise broadly similar. The Plus model features slightly larger drivers than the standard Liberties, but I couldn’t really tell a difference. I don’t think many audiophiles are buying these sorts of headphones yet anyway, so if you’re not the kind of person who spends hundreds of dollars and puts in dozens of hours of research when buying headphones, I think you’ll like these just fine. Like most true wireless headphones, both Liberty variants include cases that double as chargers for the earbuds’ 3.5 hour built-in batteries. The Liberty case is made of plastic, and includes an extra 24 hours worth of battery life for each bud, while the Liberty+ case is made of aluminum, and includes a whopping 48 hours. Both cases are about the same size, which is about twice as wide and 50% thicker than an AirPods case, to the point where you probably wouldn’t want to keep them in a jeans pocket. This is by far the biggest complaint I have about the Liberties, but it’s pretty par for the course in this space, outside of Apple’s offering. Playback controls are handled by a single large button on the outer face of each earbud. A quick tap pauses and resumes your music, longer presses skip tracks, double taps activate your phone’s voice assistant, and on the Liberty+, a 3-second hold toggles the aforementioned Transparency mode (you can also do this via a smartphone app). The buttons aren’t particularly tactile, and it can be difficult to press them without jamming the buds into your eardrums, but as an AirPod owner, the variety of available controls is very welcome. Then my advice is to buy AirPods, if only for their easy switching between devices. But if all three of the conditions above don’t apply to you, either of Anker’s Liberty ‘buds would be a terrific, more budget-friendly friendly option.